Ever since I was a kid, I have bitten my fingernails. A couple of times during childhood, my parents tried coating my fingernails with a foul-tasting deterrent called Bansuk – but despite its awful taste, I kept on biting. A few times throughout my teens and early adulthood, I went through brief periods where I stopped for several weeks, but eventually relapsed. 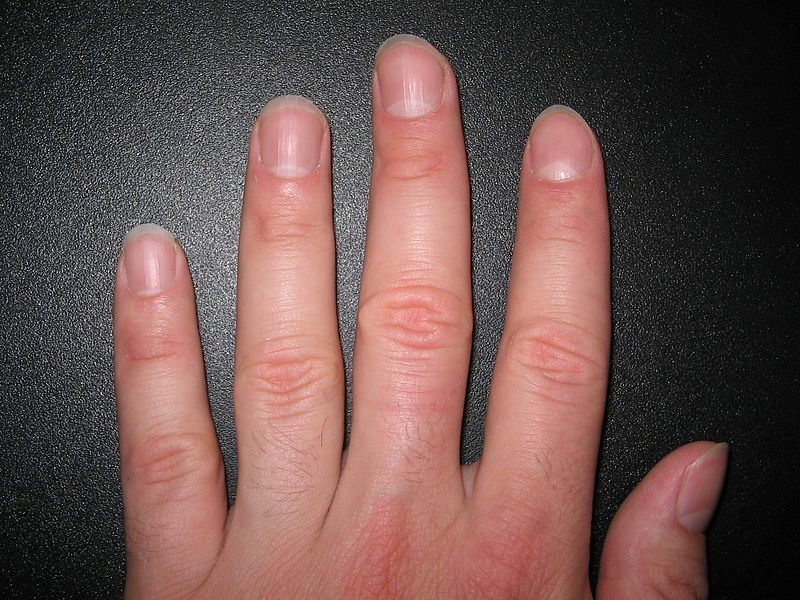 As I would learn over the years, fingernail-biting can be related to stress and is a sign of OCD behaviour – especially if you’ve taken too big a bite of a fingernail that results in unsightly unevenness, and so you keep on biting to make the rest of the fingernail look uniform, even if it means gnawing right down to the quick and having it sting for the next day or so. As well, though, I actually like the taste of fingernails, and relaxing with a large piece of bitten nail and chewing on it for a while like a dog with a bone. So, although part of me has long wanted to stop biting my fingernails because it was ugly and unhealthy, part of me shrugged and thought that it would be a problem that I couldn’t overcome (or didn’t want to). Why not try letting one fingernail at a time grow back? The more I thought about it, the more do-able and exciting it seemed. So, I chose my right forefinger as my first experimental subject. A couple of weeks later, that fingernail was looking good, and I had already moved on to others. More weeks passed, and more of my nails grew and looked better. A couple of months passed, and when I visited my family interstate for Christmas 2007, my eldest sister was amazed to see me doing something she’d never seen me do before – trimming my long fingernails with a nail-file and scissors. As well, when I told my youngest sister that I’d stopped biting my nails so much, she remarked that in the preceding few days she’d noticed something “different” about my fingers. At around the same time, I also mentioned and showed my success to my psychiatrist, who commented that it was a sign that I was becoming less stressed. Three years later, my fingernails are still looking good. I’m especially impressed with my thumbnails – they were my biggest challenge because they take so long to grow, but in the end they got there and they look the best they ever have. Every once in a while, especially if I have something on my mind at the time, I still bite my fingernails, but nowhere near as badly as I used to. And there’s been one unintended benefit that I’ve discovered through letting my fingernails grow, and trimming them instead of biting them. Grown nails are tougher nails, and a large trimmed off-cut makes for longer and more enjoyable chewing, like a dog with a bigger bone. This entry was posted in Action, Hope, Inspiration, Life Challenges, Life is Good, Life Strategies, My Story. Bookmark the permalink. I’ve just showed this post to my husband. He bites his nails right down and likes to chew on them as well. I used to bite my nails, never right down because it hurt, but I stopped while I was still at school. Instead, I just let them grow. Trouble was, they would grow so long, then snap or flake or whatever. It took me till a year or two ago to think of actually cutting them. It struck me that if I cut them when I observed weak flaky bits at the side, I could cut the weak flaky bits off and the nail would have a square edge, as it were, instead of having the flakiness perpetuated by the raggy edge caused by the nail being torn off. Et voilà! One instantly stronger nail. Thanks for your comment and showing this post to your husband. What was his reaction? Yes, as I’ve also found, it’s better to cut than to bite and tear. He seemed interested in making his nails better to chew.